The Anzac Day 2014 dawn services, marches and more will be broadcast live on ABC Extra. 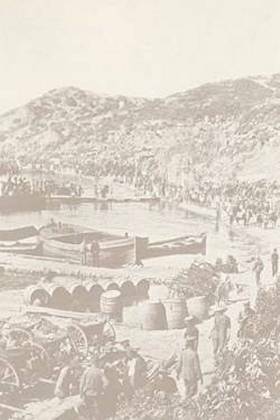 Only 700 Australians and New Zealanders have registered for the 2017 Anzac Day commemorations at Gallipoli compared with 10,500 in 2015. Information suggests that terrorists may attempt to target Anzac commemorations on the Gallipoli Peninsula this year, the federal government says. Speeches carried a distinctly multicultural flavour at a large gathering of Queensland students and community leaders shortly before Anzac Day 2015. Includes photographs from various dawn services and marches. This news page of 25 April 2012 includes links to an Anzac gallery and to other Anzac news stories. The latest ABC news items on Anzac Day. Stories of soldiers past plus more recent Anzac news. A range of news and current affairs reports on the history of the Anzacs and Anzac Day..
Anzac Day reports from news.com.au. Anzac Day images from 2012. Scroll down for links to images.. Flash video. Compilation of sound and photographs from Anzac Day dawn services and marches in 2006. Scroll down for links to videos. ● See also Anzac Day (news.com.au) above.